Evidence of deer visiting the property was visible for a week, across the ridge overlooking the creek bed, as the weather was warming and fawn needed nourishment beyond a doe’s milk. Such was the case with the trio I happened upon a couple of evenings ago: I first spotted a solo fawn munching on leaves in the brush before me. I was trying to take in the beautiful babe without alerting the dog to its presence (as usual), as not to scare it off. However, as I looked closer I realized the face of this fawn was different than the deer I normally see on the property. We locked eyes and it put one leg forward, as if to move closer. Taking a step out in faith in hopes it was safe to do so. Just then, the dog realized what I was looking at and interrupted the moment between the fawn and me, with his large intimidating bark. The fawn, startled, inched back a bit and his movement sent the dog into lunges toward him. As I fought to restrain him, the fawn did an about face and headed for higher ground. As it turned, I saw its rear and understood why this deer looked different in the face: it was an elusive white-tailed deer. What a joy it was to happen across one, so closely. I have been living in an apartment since April of 2016. Last year, when my lease was coming up, I prayed if it was God’s will for me to stay put or move. I didn’t feel led, up to that point, to begin packing up, however, I had been getting messages from the Holy Spirit for quite some time I would be relocating once again. When the Lord answered, he specifically said, “Next year you will not renew your lease. You are moving to Tennessee.” So, I renewed my lease and waited upon the Lord for future direction on that statement. I guess it was in October of last year when I felt as though I should start preparing for a move. In my heart, I wanted a homestead; a peaceful place where I could live in the quiet I don’t have in an apartment community, as well as the ability to grow my own food. Soon after, I began looking at properties in the area of East Tennessee I had felt led to live in for quite some time. In late December, I put an offer on the house I believed the Lord had for me. The irony was that particular house had been on the market for quite a long time (location was a bit remote) and of course when I decided to put in my offer, so did someone else. The seller chose the other offer. This really threw me for a loop. I had looked at quite a few homes in that area, within a 25 mile radius and my budget; the only other home I liked already had an offer on it. I prayed for direction and kept looking. I found another home, in another area of East Tennessee that I absolutely adored, that was even more my style and well within my budget. I put in an offer, which was accepted, and prepared for the home inspection. Mind you, I have worked in residential development, real estate, and my former spouse was a sub-contractor – I know what to look for when I scan a property for issues and repairs as it was once part of my job. While viewing the property both through pictures and in person, noticed what appeared to be black mold on the large wooden porch of this 2 1/2 year old property. I asked the home inspector to pay special attention to that concern. Much to my dismay, he found it was a valid concern, plus, he discovered many more things that would cost me a lot of money, both in the short and long term. The current owner had left the home vacant and moved away; it had been neglected, yes, but many of the issues were also, frankly, a shoddy build. There was no way I was buying a home with that much evidence of mold and other issues, so immediately cancelled the contract. This was both devastating and confusing to me. Had I not heard the Lord clearly when he told me I was moving to Tennessee? Yes, I had and was confident of that! But at that moment, I was blind to His actual plan and desire for me, in the future. He was definitely leading me, albeit blindly, into a move. At this point, I needed to stop and catch my breath for a bit. The enemy of this world was trying to lead me into discouragement and unbelief, in both myself and what the Lord had told me. One day, I was feeling so discouraged I began to write a post on Facebook stating as such; as soon as I wrote out the word ‘discouraged’ I was stopped in my tracks. Before I could even respond, I saw an image in my mind of the word discouraged, encircled in red with a red slash across it. “No Lord, that is not who I am in you,” I replied, and deleted the entire post. Every time after that I would start to feel discouraged, I would see that image and chuckle. He is a visual Creator, that is for certain! After two additional home offers fell through, I began to run out of time due to having to give vacate notice where I live. I stepped out in faith that God would not allow me to be homeless in 60 days, gave written notice and kept praying. I knew I had to shift direction, stop looking for homes to buy and instead focus on renting. I loathed the thought of living in an apartment for another year, but if I must, I must. My Realtor was also not giving up, she was helping me locate places to rent as well. 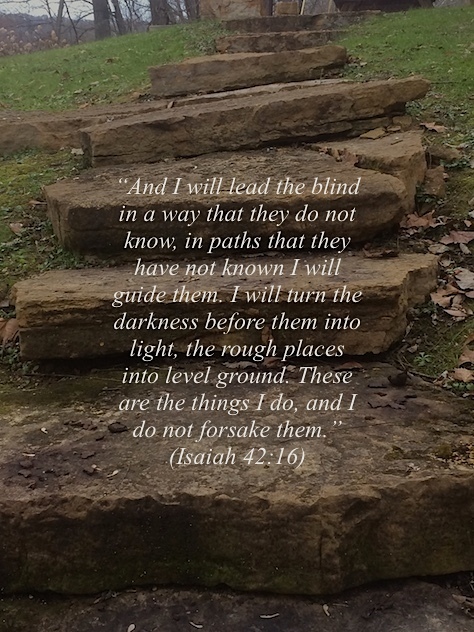 Although I was feeling frustrated and a bit stressed out, I chose not to let discouragement take root; instead, trusting that I heard correctly and was to simply keep walking in faith, not by sight, through the discouragement. I trusted my God had divine answers and was simply waiting for all things to line up perfectly for His big reveal!